EDINBURG, Texas (November 29, 2018) – The Rio Grande Valley Vipers (6-4) fell to Oklahoma City Blue (8-2), 99-110. OKC ends home winning streak for the Vipers. The Vipers came out of the gate swinging early, leading for the majority of the first quarter. Two-way player, Vincent Edwards, led the home team in scoring with eight points. The Oklahoma City Blue were led by KJ McDaniels with eight points and two rebounds. RGV ended the quarter on top 28-21. More of the same continued in the second as RGV maintained its lead. OKC headed to the break trailing 57-48 despite an effort in the late goings of the half. Tyler Davis grabbed 16 points for the Blues accompanied by five rebounds. Bruno Caboclo led the Vipers with 17 points at the half and had nine boards. As the third quarter came to an end, Vipers kept the momentum going and saw Caboclo pull away from the rest of the squad with 26 points and 12 rebounds; his third double-double of the season. On the offensive effort for the Blue, Davis continued to lead, now with 27 points. OKC was shooting 73.1% from the free throw line at this point and 48 points in the paint. Oklahoma made some noise in the final quarter of play as they tested the Vipers. Davis capped off his big night in South Texas with a season high 31 individual points. The strong push by the Blue late was enough to hand the Vipers their first home loss of the season. RGV is now 5-1 at home, 6-4 overall. Caboclo ended the night with a new season high 26 points; his third consecutive game above 20 points. He added 12 rebounds to seal the double-double. Brandon Sampson also had a double-double with his 17 points and 10 assists. The Oklahoma Blue kept their patience throughout the game and paced themselves to a big road win despite missing two players who are currently competing with team USA. 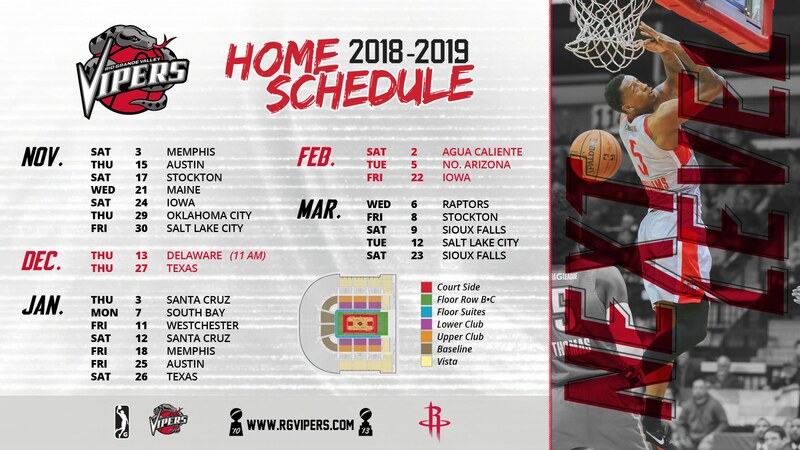 The Vipers return to action at home on Friday, November 30 against Salt Lake City with tipoff at 7 p.m. For more information, contact the RGV Vipers at 956-56-ARENA or visit www.rgvipers.com.